Supplemental examination Supplemental examination in Latin is required before completion of the bachelor's degree programme if this subject was not completed satisfactorily with at least 10 credit hours at a higher-level secondary school. VO Fundamentals of Cultural Studies (CM8/2 hrs. /5 ECTS-Credits). (2) Successful passing of all exams of the Studies Induction and Orientation Stage entitles to passing all further courses and examinations and to writing the Bachelor’s Thesis. (3) Before successful completion of the Studies Induction and Orientation Stage courses amounting to 20 ECTS-Credits may be passed. The registration requirements listed in the curriculum must be met. (1) The Studies Induction and Orientation Stage (STEOP), with a duration of one semester (30 ECTS-Credits), provides an overview of the study programme and its structure in order to give students an objective basis to assess their decision to pursue their chosen subjects. (3) A positive result (passing grade) on the examinations specified in Paragraph 2 permits students to attend all courses and take all examinations following the Introduction and Orientation Phase for Students (STEOP) and to write a bachelor's thesis as described in the curriculum. The registration requirements specified by the curriculum must be met. The exemplary course sequence given below is recommended for full-time students beginning their study programme in the winter semester. 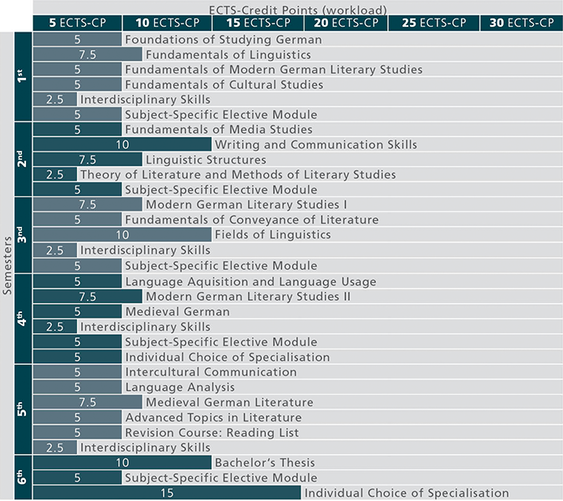 The table shows one possible course sequence for the bachelor's programme and is not compulsory. Delays resulting from repeated examinations are not taken into account. The standard duration of the study programme is 6 semesters or 180 ECTS-Credits, whereby according to the Universities Act of 2002, a workload of 1,500 (real) hours per academic year must be fulfilled, corresponding to 60 ECTS-Credits (one ECTS-Credit is equivalent to a workload of 25 hours). The objective of the Bachelor's Programme German Philology is scientific examination of German language and literature, its development and functions in present and history as well as the cultural, social and anthropological-symbolic processes they are embedded in. Thus, language and literature are to be understood as comprehensive cultural phenomena which help to recognise, understand and form them and foster reflection about social and cultural processes, also in view of future development; a special emphasis is put on the gender aspects which also characterise language and literature in our culture. Thus, besides sound knowledge of historical, systematic and pragmatic aspects of language and literature and an insight into conveyance of literature in practice, knowledge of the media, their structures, action mechanisms and creative possibilities require considerable space within the Bachelor's Programme in German Philology. Studying the fundamentals and characteristics of oral and written communication and acquisition of high level oral and written language skills are other high priority objectives. As completion of the study programme is prerequisite for further scientific study programmes, teaching is scientific-based with a large diversity of theory; however, profession-relevant components in terms of practice-orientation and thus issues of teaching language and literature are also highly considered. Graduates are able to elaborate, evaluate and implement scientific developments in the fields of language and literature and to apply them in interdisciplinary contexts. They possess scientifically well-founded theoretical and methodical problem-solving skills and key competences such as good verbal and written expression, aesthetic sensitivity and critical faculty. The Bachelor's Programme German Philology qualifies graduates for all occuptional fields of cultural life. They are prepared for a wide range of activities and careers in publishing, media, bookstores, public libraries, proofreading and editorial work, journalistic and publishing activities in print media, radio, television and new media as well as in public relations or in the tourism industry. In additon to activities in cultural administration and mediation, the study programme prepares for occupational fields in international cultural and educational change or in public and private adult education as well as in public relations.